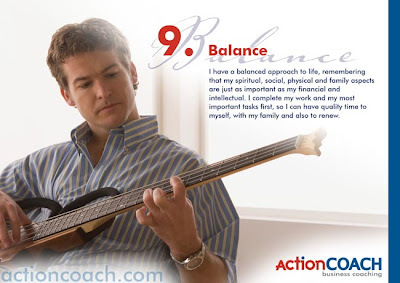 As we all know, maintaining balance is key to feeling good and operating at a level of productivity necessary to achieve desired outcomes in all areas of life. While it may not be easy, it is imperative that we recognize, accept and act on some principles that may seem counterintuitive or simply difficult to embrace. First of all, we must recognize that we cannot maintain optimum productivity in one area 100% of the time. For example, we cannot consistently offer the same level of mental investment into an operating budget for 24 hours straight. Our minds and bodies are simply not given to that kind of intensity for an extended time period. We must take breaks, change our activities, and give different areas of our being the opportunity to exercise. For some people, 20 minutes at a keyboard and 20 min away from the keyboard is a good rule of thumb for avoiding eye strain or carpel tunnel syndrome. Taking a brisk walk before engaging in learning or creative problem-solving can improve our mental capacity and chemically improve our chances of achieving satisfactory ends quickly. The key is to find what works to bridge the gap from where we are to where we are going, and having the courage to embrace it. And know that the answer does not lie in duct-taping ourselves to our desk for 3 days. Second, we need to recognize that focus is essential. And by that, I do not mean living at the office 365 days a year staring at the same numbers over and over. We need down time. And we must have down time that is as intense and focussed as our work time. It is interesting to note that workers who have little focus at work often tend to have little focus outside of work, as well. They are constantly thinking of work as much as they are constantly thinking about leisure time activities. They are often completely unrested, imbalanced, and tend toward higher stress levels and burnout. When it's time to relax, put your mind, energy and power into something completely and wholly unrelated to anything at work. Focus hard on play and you will find a greater power to focus at work. In whatever activity you are engaged in, focus. Get focus, keep your focus, and don't release your focus until it's time to change that focus. Focus. Third, recognize that you are the boss. In every situation in which you find yourself, you have choices. You are responsible to ensure that your life is balanced. It is not a decision made by your spouse, your business partner, or your mentor. Choose how you will balance the demands in your life. Choose how you will invest your time. Choose your thoughts as carefully as you choose your activities. Ensure that when it's time to rest from one labour, the other areas of your being are awakened and given their opportunity to exercise. Choose to discipline yourself, balance your energies, and focus. Make good choices day after day, and feel good about those choices as you begin to embrace a successful lifestyle. You are your own boss - no matter what.